The Beautiful Hudson Valley – Perfect Wedding Location! Wedding season is in full swing, and we recently posted on our blog about how we love to read wedding blogs to stay up to date on wedding trends, particularly ones that deal with wedding candy! Another wedding blog we just love to read is the Best Hudson Valley Wedding Ever blog! This aptly titled blog talks all about the beautiful Hudson Valley, NY region, and is authored by Stephanie and Jeff of The DJ Solution, NY wedding entertainment specialists. Sure, their posts are tailored to the Hudson Valley region, but the topics and viewpoints apply to weddings no matter where you live! We especially enjoyed their recent post, “7 Wedding Cake Alternative Ideas“, and we’d like to add an 8th – a candy buffet! Wedding candy has been a much-loved wedding essential for generations now, and can be so much tastier than some wedding cakes out there. The blog’s How To Plan A Wedding section is a must for engaged couples, and has tons of practical, helpful tips! Whether you’re lucky enough to live near the Hudson Valley region or just love to admire it from afar, the Best Hudson Valley Wedding Ever blog is a must-read! We’re Lucky To Know Lucky + Lovely! If you’ve checked out our site, you’ve likely seen that Wedding Candy is one of the major categories on our site. Candy is such a natural fit for a wedding – it’s so sweet, just like the couple getting married! We’re always taking a look at different wedding blogs to stay on top of wedding candy trends, and had the pleasure recently of coming across the Lucky + Lovely wedding blog! The blog is authored by the lovely Melanie Carter, a talented graphic designer for packaging, stationery, the web, and prop styling, and she blogs all about pretty wedding details and the fun and quirky products she adores. The Lucky + Lovely blog is just so pretty and a great read – we can’t get enough of her delightful posts, and we hope you’ll head on over and take a look, as well! 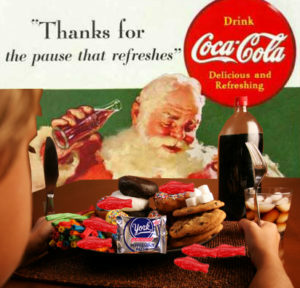 If Coca Cola is the "Pause that Refreshes," Candy has to be the "Pause that Delights." If Coca Cola is the “pause that refreshes,” candy has to be the “pause that delights.” Like its liquid counterpart, candy has the ability to give us a jolt on a Monday afternoon when we need it most or provide the perfect ending to a spectacular meal. No matter how young or old you may be, the sweet confection that comes in hundreds of varieties always satisfies. Whether it be a Snickers bar in the afternoon, a Peppermint Patty after dinner or some Pixi Sticks first thing in the morning when we need a lightening fast kick in the pants to start the day, candy is there. I remember as a youngster, scouring the house for pennies, pocketing them and heading down to the corner convenience store to buy some Swedish Gummy Fish, which at that time cost a penny a piece. While the clerk counted the pennies, I counted the fish, mixing a variety of classic red and my favorite, grape. I’d walk back home eating them one-by-one out of the paper sack that was their very temporary home. Everyone seems to have their favorite candy bar. Unfortunately for me, my favorite only comes one time a year – Easter. I have to confess that I am completely addicted to Cadbury Mini-Eggs. I don’t know what it is about that rich, creamy Cadbury chocolate and crisp, sugary coated candy shell that makes these my favorite, but I dream about them! Cadbury makes great chocolate, but in my book, there’s nothing like the Mini-Eggs. In fact, my friends at BlairCandy.com sell me cases of them so I can enjoy this sweet delight throughout the year. As much as we have our favorites, we all have our least favorites. Topping the list for me is the nostalgic candy, Necco Wafers. My father was a food broker, and one of the lines he carried was Necco. So needless to say, we always had these unique, round, flat candies that came in a wax paper roll, around the house. He loved them, my mother loved them, and I hated them. But they’re still popular! I love looking at the Nostalgic Candy section of BlairCandy.com’s website. It’s like taking a trip back into my childhood looking at old time favorites like Black Jack or Teaberry Gum or an Abba Zaba bar. So next time you need a little get-up-and-go, pour yourself a coke, grab a candy bar and enjoy a pause that refreshes and delights.